While searching bank rolls, one can find three common types of altered unplated Lincolns. The first two types having the plating removed: a Lincoln soaked in a corrosive; a Lincoln subjected to some type of reverse electrolysis; the last is when a Lincoln has been plated on top of the original copper plating. Below are some shots of various altered or fake unplated Lincoln cents that had the plating removed along with photos of genuine examples. The reverse electrolysis examples are from member tnspro (Jim). Genuine 1995 (left) and the plating removed by electrolysis 1995 (right). Black arrows show the different sheen observed to the surface. Yellow arrows show the damaged surface of the unplated. It exhibits linear valleys and small raised islands topped with copper. The reverse shows more extensive damage. The blue arrow is an existing plating blister that somehow remained. Surface characteristics of the coin on the right suggest the process of plating removal leaves evidence of the original plating issues such as split plating, areas of thinner plating and blisters. Details: top five images had the plating removed; bottom four are from a genuine Mint error. Whole coin shots: top example had the plating removed; bottom is genuine. 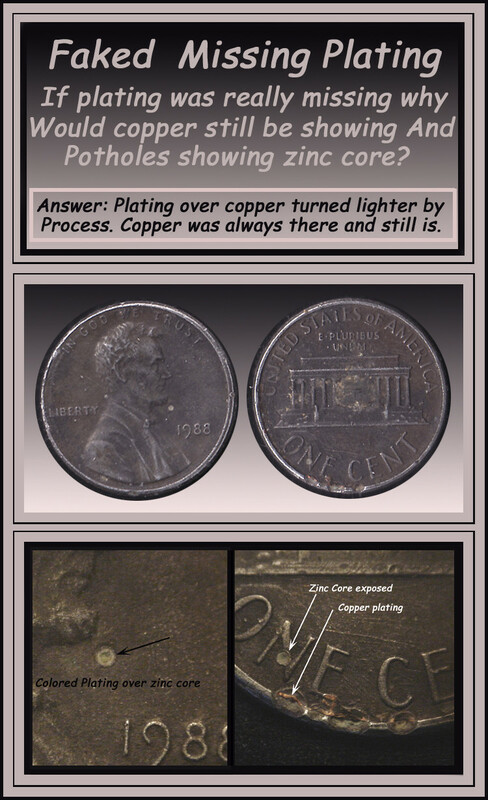 The genuine example exhibits a dark area adjacent to the copper plating which appears to be zinc-oxide on the surface. Details: no evidence of the plating being stripped, the zinc being damaged. No copper islands or valleys of missing zinc. The coin still has a nice sheen and is underweight (2.43g). Keys areas show die flow lines. Details: why there is a loss to detail, the amount is significantly less than either of the examples that were stripped of their copper. Details such as die scratches remain. Plating blisters, split plating or plating disturbance will all remain under the new plating. At the back of Lincoln’s neck are little bubbles. A plated Lincoln can be done in any white metal, mercury (which can be rubbed on) or even a metallic paint. All will be overweight.